Once upon a time, I had a job as director of administration for a perky little software-development company in San Diego; and every quarter I had to make a financial presentation to the company's board of directors. Now, these weren't some dinky little Tinker Toy presentations that consisted of printing three or four numbers onto a transparency, asking my audience for questions, and calling it a day -- they were knock-down, drag-out presentations of incredibly detailed cost-accounting data for something like three million different projects (spreadsheets containing labor hours and dollars, overhead, material, travel, G&A, profit -- the whole nine yards; no, make that the whole ten yards). "Economy, what the hell is that crap?" I got the message -- and quick. I ran to the nearest Lotus 123 expert and asked for advice. The answer? Graphs. And not just any graphs -- full-color, grab-'em-by-the-seat-of-their-retinas Technicolor graphs. Sure enough, it worked. 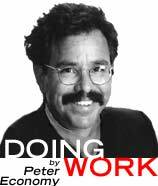 Instead of featuring pages and pages of boring numbers -- and transparencies that were enough to send anyone screaming to their nearest optometrist reeling in pain -- Peter Economy Presentations became works of art, things of beauty, not-to-be-missed events. They dazzled instead of frazzled my audience. The oohs and ahhs were deafening. Have a plan. Before you start generating lots of pretty graphics, first outline your presentation and develop a script of what you're going to say, and when you're going to say it. Identify your main points and data, and then build graphics around them. Don't overdo it. Don't try to jam too much information into each graphic, and don't use so many graphics that you dilute their impact. It's better to keep your graphics simple, and to save them for illustrating key points or the most important or complex data. Too many visual aids can actually hurt your presentation rather than help it. Use simple fonts and colors. Although your computer can probably create more than a billion different typefaces -- in any size, shape, and color -- you'd be crazy to try them all out on your client. Stick with simple, easy-to-read fonts (like Palatino for body text and Helvetica for headlines), and pick a size and color that show up well against the background of your image. Also, avoid using more than three font/size/color combinations on one page. A few such distinctions can clarify your meaning. A truckload will make people crazy. 2. Check yourself (before you wreck yourself). Interested in a quick way to have your client stick a big label on your back that reads "Kick Me, I'm a Loser"? Simply give him a report loaded with typos, inaccurate figures, or incorrect results. The extra few minutes you invest in proofreading or double-checking your work before you deliver it to your clients is guaranteed to pay off for you and your business big time. (If you've got time, you might want to let the work sit overnight and then look at it with new eyes.) If you have neither the energy nor the inclination to give your work a proper review, run it by a trusted friend or associate first. Someone should look over your work before your client sees it. 3. Quality materials mean quality product. Remember the book Dress for Success? The entire premise was this: the better you dress in business situations, the more impressed your coworkers, your customers, and your boss will be with the work that you do. The same is true about the products and services you deliver to your clients. Use lousy quality, five-bucks-a-case printer paper in your reports, or have your contact sheets printed by Joe's Liquor and Photo Lab down on the corner, and your clients are going to think that you're a lousy quality IP as well. I make a point, for example, of using relatively expensive, 24 lb. Southworth Antique Laid paper for all my project proposals to clients. It's not cheap -- about $19 a ream at Staples or Office Depot -- but it sends a very professional, high-quality message to those who receive it. Visit your local office supply store and walk the aisles to compare the quality of materials that are available to you. While you can buy junky paper and other supplies for rough drafts, spend the extra for the stuff you deliver to clients. 4. Kinko's is your friend. As you're no doubt already aware, today's computers, software, and printers can make any business -- even a one-person operation that's headquartered in a closet down the hall -- create presentation materials that are the equal of anything produced by the largest Fortune 500 company. But if you can't afford (or don't want to invest in) a $10,000 color laser printer, it's no problem. Simply email your files over to Kinko's, Mail Boxes Etc., OfficeMax, or the like, and let them do the rest. Of course, clients ultimately expect more than snazzy graphics and thick, beautiful paper -- but a polished presentation will go a long way to making sure that they feel all warm and fuzzy about having you on the job.